Letterpress info and supplies in U.K. Page first written in January 1997 by David Bolton and last updated 24 January 2019. Handscapes won the first prize, of $10,000, in the City of Busselton Art Award 2016. The book is a joint work printed in Cowaramup, Western Australia by Claire (letterpress and free printing), and Molly Coy, (illustrations and binding). An Accent Specimen has slowed as a new collection of accent matrices is having to be catalogued, before production can start. Having identified the matrices, an example of each accent in each face and size will have to be cast. Depending upon the number of different accents, the format of the book has to be decided, the accents named, and some unit widths need to be checked with records at the Type Archive. The Specimen will include all the non-Latin characters, whether accented or not, that the Press holds matrices for. A subset of the Specimen showing just the Cyrillic letters and accents is now available. A Figure Specimen is now available. It shows some 8300 figures (numerals and fractions) that the Press has matrices for. Signs and Symbols was finally completed on 9th November 2009 after some five years work, and issued as A Sign Specimen complete with two pages of Addenda and Corrigenda. A 4 page letterpress version of the Addenda and Corrigenda replaced the earlier laserprinted one(s) in December, and a supplementary 2 page Addenda and Corrigenda II was laserprinted in January 2010, and updated in July 2010. A 6 page Addenda and Corrigenda II was issued in September 2012, part letterpress and part laser printed. This replaces the earlier issues (but not the December 2009 edition). Addenda II incorporates both some extra signs, and many of the missing unit widths, now added from information held at the Type Archive, London. The Addenda sheets may appear overly extensive, but arose partly because the initial edition was only intended as a draft, and partly because it had to be printed in a hurry, before the Vandercook press was disposed of. A Supplement sheet showing some 285 signs acquired since the Sign Specimen was available in 2017, but has now been reprinted with a few extra signs that have come to light. A specimen of some 8300 figures (numerals and fractions) that the Press has matrices for. Sizes range from 5pt to 60pt, serials from F9 to F2558 (though not the complete range) and type series 1 to 696 (again, not the complete range). Set in 10pt Modern Extended. 22pp. 11½ x 6 ins. 30 copies. UK£15. Text and image integrated to reflect five different aspects of the landscape of the South West of Western Australia. A series of collotypes, etchings, linocuts, leaf prints, metal and wood type, printed by Claire Bolton and Molly Coy on various papers, and published by mollyclaire editions. 156pp. Approx 10¼ x 11½ ins. 12 copies. This book won the City of Busselton Art Award 2016. See some of the pages. A specimen of all the Monotype sign and symbol matrices held at the Press, with a brief introduction to their use. Set in 10pt Modern Extended. 88pp. 11¾ x 5¾ ins. 40 copies. UK£20. Issued with Addenda and Corrigenda 4pp. and Addenda and Corrigenda II 2pp. A set of two artists' books about corrugated tin structures in Australia, with linocuts by Katie Clemson and an original poem by Anne Bell. Set in 36pt Spectrum Italic. 22pp. 24 x 28 cm and 16pp. 14 x 28 cm. 35 copies. UK£600. See also Further details. Shows the borders that we have acquired, or found at the back of drawers, since printing A Border Specimen. It is in the same format, showing one line specimens, and inch square patterns. Set in 12pt Bembo. 16pp. 11¾" x 8¾". 120 copies. UK£25. Maddie's fifth birthday book, about a princess and her petticoats. Two hand coloured line drawings, text set in 10pt Gloucester Bold Italic. 16pp. 2¾" x 2¾". 60 copies. UK£15. See also Further details. A series of single copies of miniature flower books, with watercolour illustrations and hand-written text. UK£60 for each book. See also Further details. The latest wood type specimen, printed in two colours. Japanese binding with paper covers. 20ff. Approx 4" x 10". 40 copies. UK£20. See also Further details. A miniature 32 page specimen of 6pt borders and 6pt type settings. Text set in 6pt Old Style, Plantin, Baskerville, Imprint, Gill, Greek, Grotesque, Modern, Spartan, Times, Univers. 32pp. 2¾" x 2". 50 copies. UK£20. 34 samples of the 1950s Sanderson range and their current replacement, together with a brief history of decorated papers. Set in 11 on 12pt Ehrhardt. 32 sheets sewn into boards. 6� x 9 ins. 95 copies. UK£60. Our granddaughter's 3rd birthday book, as a sequel to A Little Alphabet and A Small Piece of Action. A single section counting book illustrated with printers' stock blocks and dingbats to a count of 10. 16pp. 3 x 2 ins. 120 copies. UK£5. (This book had a working title of A Small Count). See also Further details. About the connection between artist Robert Gibbings and woodworker Bill Pointer, with a wood engraving by Robert Gibbings of his own bench and by Simon Brett of Bill Pointer's bench. Set in 14pt Perpetua. 24pp. 9 x 6½ ins. 120 copies. UK£30. A small group solely for the exchange of material that has been printed letterpress. Members contribute items approximately three times a year, with numbers being kept small enough to make the task of printing not too onerous. Originally started by Claire, Alan Brignull at the Hedgehog Press now co-ordinates the distribution. Although the Press has run a very successful five day Letterpress Printing workshop for some nine years, it does not currently have the facilities for this. However, workshops on table-top printing or early printing methods are occasionally offered at various other locations, so please e-mail Claire if interested. Also, it may become possible in the future to offer combined printing and casting workshops jointly with Richard Lawrence at his studios in Oxford, which is where the Press now houses its typecasting equipment. Occasional workshops are also run at the Abbey Press in New Norcia, Western Australia. For many years, the Press was able to provide a place for an apprentice for a period of one to three months, once or twice a year. However, this is no longer possible, as we have moved to smaller premises and, sadly, have disposed of all our large presses. Sunday afternoon open workshops on casting type from Monotype Composition and Super casters are held approximately once a month from 2pm to 4pm. Dates for 2019 will be settled shortly. These informal sessions are for anyone (enthusiast or otherwise) wanting to see or try out Monotype keyboards or casters, but visitors are always welcomed at other times, when convenient. (See a glimpse of the equipment.) Phone 01235 525227 or e-mail alembicpress@googlemail.com for further details. For some years the Press held an Open Day, when all its equipment and productions were on show, but as much of the equipment has now gone, only the Open Typecasting afternoons on one Sunday a month now continue. However, Hurst Street Studios occasionally has Open Days and the Press's Monotype equipment is in action on those days. The Press used to be housed in a 70ft x 20ft stone barn, until June 2010 (see a view of the printshop and some of the presses, as they used to be). The larger printing machines were slowly passed on to better homes, but the Farley cylinder proof press, a Sigwalt Model 4 and two Adana 8x5, one HS3 and one 5x3 table-top presses are now housed in our new premises. These can be seen in the picture on the left. This new printroom in Abingdon still has a bit of fitting out to do, but all-the-same is now functional for small jobs. The Press has reduced its range of metal and wood type, but as can be seen on the right, still has 5 point up to 90 line, for hand setting, and 5 to 14 point for machine setting (using a Monotype keyboard and caster). 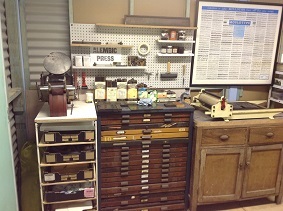 The space is bigger than it looks, but in the picture on the left you can see the Adana 8x5 on the left, and the small table-top proof press on the right, beneath the Mouldtype poster. 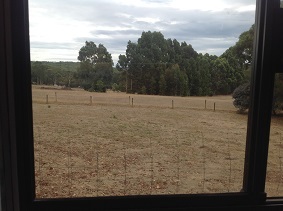 The picture on the right is the view beyond the shed, toward the Margaret River (the roos have moved out of shot). This picture will be replaced in due course by a better one, showing the entrance to the shed, and indeed some of the distant pasture shown here is already under development for a housing estate. In addition, there continues to be our collection of Monotype matrices, keybars, etc., plus two keyboards, one Super caster, and two Composition casters, all in use for casting and for demonstration purposes. See a view of the equipment in its new location at 50 Hurst Street in Oxford. We maintain a small list of letterpress suppliers and information available in the U.K. at www.letterpressalive.co.uk, and in Australia at www.australianletterpress.info. Suggestions for additions to these lists are always welcome, but note that they try to keep within the two countries. Note also that they are not comprehensive lists of letterpress printers, but rather a list of where letterpress can be seen, asked about, learned, helped with, or where ink, paper, rollers, etc., can be obtained. ''Cloth impression marks in the 15th-century editions of Johann Zainer - evidence for paper damping? '', Journal of the Printing Historical Society, new series, number 12 (2008), pp.5-33. ''Links between a fifteenth-century printer and binder'', Early printed books as material objects, Bettina Wagner, Marcia Reed, eds., (Berlin: De Gruyter, 2010) pp.177-189. ''Further leaves from a ''lost'' edition of Dinckmut's Regimen sanitatis'', Gutenberg-Jahrbuch 85 (2010), pp.79-84. ''The influence of type and spacing on the design of the printed page'', Jaarboek voor Nederlandse boekgeschiedenis 19 (2012), pp.48-64. ''Leading but not as we know it: some evidence for interlinear spacing in fifteenth-century printing'', Journal of the Printing Historical Society, new series, number 20 (2014), pp.25-37. ''A Print Run of 68+1 Copies of a Memmingen Indulgence c.1504-15'', Gutenberg-Jahrbuch 91 (2016), pp.141-149. The fifteenth-century printing practices of Johann Zainer, Ulm, 1473-1478, Claire Bolton, (Oxford & London: Oxford Bibliographic Society and Printing Historical Society, 2016). ''Typesetting and Printing in the Fifteenth Century'', Materielle Aspekte in der Inkunabelforschung, Christoph Reske and Wolfgang Schmitz, eds., (Weisbaden: Harrassowitz Verlag, 2017) pp.147-163. ''Typecases: history and development'', Journal of the Printing Historical Society, new series, number 25 (2016), pp.25-49. In addition, as part of researching early printing methods, the Press is a founder member of the Dürer Press Group which commissioned a new wooden hand press, based on Dürer's sketch of 1511, and which is currently housed at St Bride Institute in London. Arising from a topic on the LETPRESS listserve group, we show some layouts of various styles of typecase. Blank case layouts are also shown, should you wish to insert your own lay. The pages are all separate, for ease of printing out, or downloading. If you are trying to identify a particular case, then Typecase Identification is an attempt to make this easy! Otherwise, an index to all the pages is available, as is a short introduction and a glossary of (some of) the terms used. There is a brief note on variations in Job and Double Case, and Lower Case, and Upper Case styles. Some notes about the quantities of type possible in a Case and a Bill of type are also provided. Over 300 different typecases are shown to date, concentrating mostly on normal (ie full) size cases for metal type, but including a few exotic cases, figure and spacing cases, etc, by way of example. (For a list of all cases actually illustrated in a particular Equipment Catalogue, see for example Hamilton 1907). Dates are given, as derived from the source documents (which are all listed in Sources), but for many of these sources there may be an earlier edition, or reference, that has not yet been consulted. Whilst the cases shown are based on illustrations, or actual cases seen, Specimen Books and Equipment Lists often list more cases than are illustrated, and these have had to be ignored, so again, some dates may be earlier. This list is only a very small selection of what is available, and for example Briar Press, Ton Cremer, and Dave Tribby all have a much fuller selection. Letterpress Alive list of resources in the U.K.